With the fate of the Goldenacre side’s BT Premiership challenge dependent on a bonus point win over Currie Chieftains, Heriot’s have ensured that the game will go ahead tomorrow by switching it to the Oriam facility at Heriot-Watt University (kick off 2pm). It will the first time a domestic Scottish rugby match has taken place indoors. Heriot’s coach Phil Smith welcomes back Stuart Edwards, Charlie Simpson and Robbie Mulveena to the backs, while he has also has injury-victim Struan Dewar back in the fold and starting on the bench, but is without Martin Hughes, a star performer in the Scotland Under-20 side’s victory over England last weekend. A recent bout of mixed form means that Heriot’s must take all five league points tomorrow and repeat that outcome in next Friday’s rearranged clash away to Boroughmuir. As so much is at stake, Smith is hopeful that the change of venue will not deter spectators from making the trip to the west of the city. “With it likely to be the only game on this weekend we are delighted to be able to provide this and hope people are able to come along this Saturday, weather permitting”, said Smith. A surprise defeat for Chieftains at home to Marr two weeks ago means that, although they will feature in the latter phase of the competition, a home tie is not yet secured. They must prevail in tomorrow’s final regular season encounter to cement a top two finish. 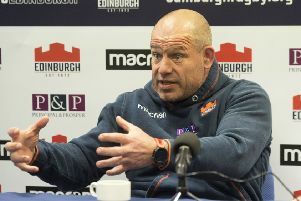 Chieftains coach Ben Cairns has Glasgow Warriors duo Ratu Tagive and Richie Vernon at his disposal and Jamie Forbes is restored at stand off alongside Charlie Shiel. In the pack, Stephen Ainslie starts at blindside, while Mike Vernel is at lock in place of Vince Wright who is on international duty with the Netherlands.